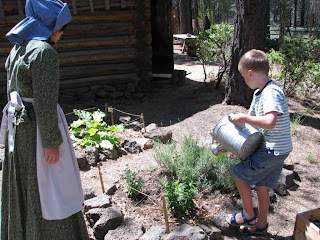 Saturday we went out to the High Desert Museum for their "Frontier Fourth"
No contests or prizes for Ethan to win here, just work to do. You are truly the blogging a Queen. You have some serious adventures! Ah, good hard work. I Love places like this. They are so cool! I totally agree with mott6. It is always so fun and incredible to see how many fun things you guys do as a family. I hope to be a little like you someday! 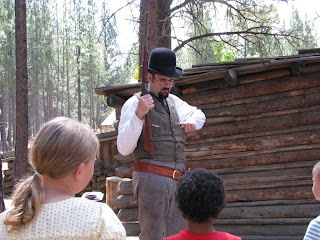 I love that our museum tries not only to be authentic, but also for interaction. It helps bring you more into the story. 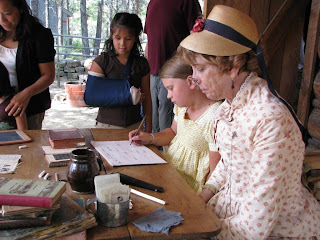 The lady who plays the teacher is great and the one in the log house too:) Very fun times.